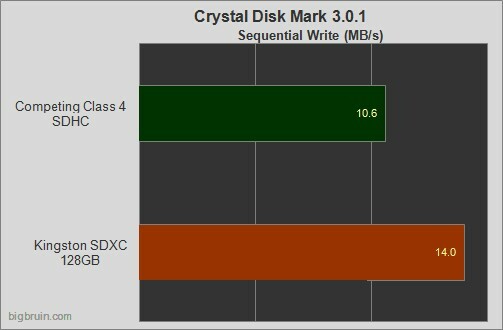 The Kingston 128GB SDXC flash memory was tested for transfer speeds using CrystalDiskMark 3.0.1 and a compressed file of approximately 1GB in size for real-world file transfer performance. Read and write speeds were evaluated in MB/s, with higher numbers being better. 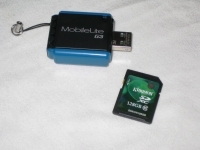 The SDXC card was plugged into a Kingston MobileLite G3 USB 3.0 memory card reader, previously reviewed at Bigbruin.com in May of 2012. 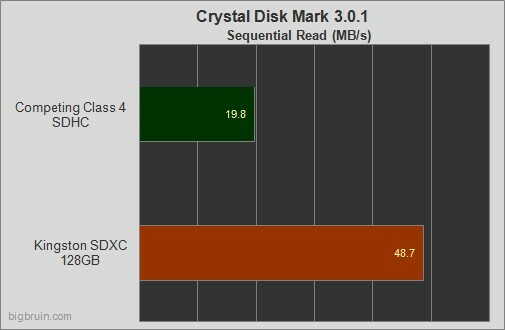 For the sake of comparison, a class 4 rated SDHC card was benchmarked in the same tests as the class 10 SDXC card.